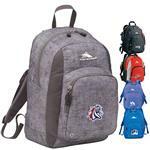 This High Sierra Beserk Backpack is great for travel, office, and executives! Features a padded computer sleeve which holds most 17" laptops as well as a dedicated Tech Spot to hold your iPad or other tablet device. Deluxe organizer pocket, pen pockets, smart phone holder and key fob. 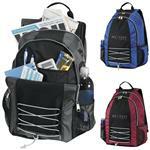 S-shaped, Vapel™ mesh Airflow™ padded shoulder straps with Suspension System and integrated media pocket. Comfortable padded back panel. Signature High Sierra® hardware. Includes lifetime warranty. 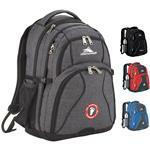 A great High Sierra custom backpack - a name brand promotional product.